This classic monogram is the perfect personalization for this cobalt blue growler. Add your hand crafted beer or wine and you are set. Leave it natural for an etched look. Are you a beer Geek? 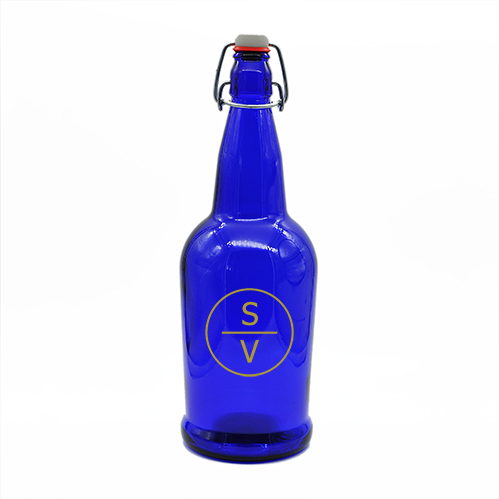 This 1 liter blue cobalt growler is a must have for your special home made concoction. Adorned with this 2 letter monogram, your family and friends will ooh and ah when your pour them a glass of your best brew from this beautiful bottle. A swing top lid will help ensure your beer or wine stays fresh until you are ready to serve it. Choose from an natural etch look or color fill in red, white or gold. Don't hesitate and order yours today!